My grocery list is filled with healthy foods, but I never know how long everything will stay fresh. Do I go by smell? Do I keep a calendar? Help! I don’t want all my smart supermarket shopping to go to waste. Great question! The USDA and FDA offer so much helpful info on this subject, which I’ll relay below. And don’t discount your freezer as a way to stock those healthy foods! Technically, they’ll stay good in there indefinitely, but they’ll taste best if you stick to the time frames listed below. And keep reading for my Freezing & Reheating Guidelines, perfect for recipes! Fridge: 1 - 2 days. Freezer: 9 months. Fridge: 3 - 4 days. Freezer: 4 months. Fridge: 1 - 2 days. Freezer: 3 - 4 months. Fridge: 3 - 5 days. Freezer: 6 - 12 months. Fridge: 3 - 4 days. Freezer: 2 - 3 months. Fridge: 1 - 2 days. Freezer: 2 - 8 months. Fridge: 3 - 4 days. Freezer: 2 - 6 months. Fridge: 2 weeks. Freezer: 1 - 2 months. Fridge: 3 - 5 days. Freezer: 1 - 2 months. Counter: 2 - 3 days. Fridge: 7 - 10 days. Freezer: 3 - 6 months. Use these tips to freeze your favorite recipes: casseroles, soups, and more! To Freeze - Let your food cool completely. 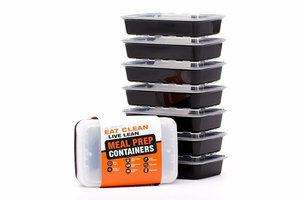 Then divvy up the food into equal servings, using containers that are freezer safe and microwave friendly. (Choose containers a little larger than the food itself, since it expands when it freezes. We love this set!) For individually portioned items like meatloaves and baked goods, wrap tightly in plastic wrap prior to placing in the containers. To Reheat - If possible, thaw your food in the fridge overnight. This way, all you’ll have to do is remove or vent the lid, and microwave for a few minutes (less time for baked goods)! If you didn’t thaw the food in advance, no worries -- just remove/vent the lid, and use the defrost setting on your microwave, checking and stirring it every minute or two. Who wouldn’t want this helpful info!? Be a good pal and click “Send to a Friend” now!